Did Kanye Steal Jay Leno’s Thunder? We all knew Kanye West was going to be repentant tonight on the Jay Leno show over his outburst last night against Taylor Swift for winning the MTV best female video award instead of his preferred choice, Beyonce. There were some very pregnant pauses during the segment, particularly when Jay asked Kanye whether his mother, who died a few years ago, would have criticized him for it. Hardly an unexpected question, yet Kanye clammed up and then gave another apology. It definitely will be the most talked about segment of Leno’s opening night show tomorrow. I thought the Jay Z/Rhianna/Kanye song was the best part of the show, followed by Dan at the car wash followed by Jay’s faux interview with Obama. I thought the monologue fell kind of flat, as did the Seinfeld/Oprah segment. As to who will watch the show, the fall lineup on CBS and ABC for that hour have nothing of interest. Given the lack of competition, I don’t see how he fails. 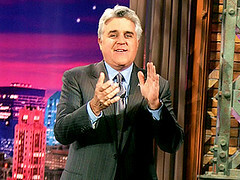 Jay Leno ends his 17 year run on the Tonight Show this evening. He’s got a surprise planned, so be sure to tune in. Update: Here are some highlights from his monologue.